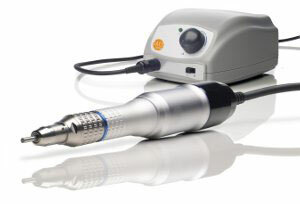 In this technique individual hair follicles or group of 2-4 follicles (follicular units) are extracted either manually or with a motorized rotating punch device. The punch used for this is similar to skin biopsy punch and comes in various sizes from 4.5mms to 0.8mms. 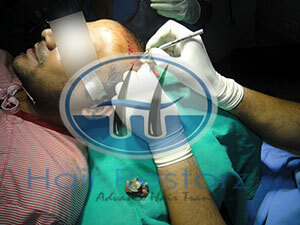 The punch is inserted into the donor area encircling the follicle unit to be extracted. The punch is pushed inside with rotating movement and to a depth sufficient enough to release major attachments of the hair follicle with the scalp skin. The punched-out follicles are then manually extracted with forceps or with the motorised suction device which employs no touch technique for follicle extraction. Follicular unit extraction technique has the advantage of not creating a linear scar resulting in a shorter and more comfortable recovery time and allowing the patient to keep their hair short after the procedure. The disadvantages of follicular unit extraction (FUE) technique are: creation of numerous hypo-pigmented round scars in the donor area, an increased follicle transection rates and it is more time consuming for both the patient and the physician. In follicular extraction technique a larger donor area is needed for extraction of smaller number of follicles. The number of hair follicles extracted with this technique are less as compared to the strip technique leading to multiple sessions for larger bald areas. This technique also renders the scalp donor area unfit for further follicle extraction using the strip technique. After harvesting the grafts, the follicular units obtained are dissected under microscopic visualization. Dissection under magnification is specially important to prevent follicle transection. In follicular unit transplantation, hair follicles are separated into clusters of 1-4 hairs are transplanted. On an average a single naturally occurring follicular unit contains about 2.3 hair follicles. The final separated hair follicle ready for transplantation should have a pear shape where in the epidermis has been maximally trimmed and the dermal and subcutaneous tissue surrounding the follicle isthmus and bulb remains intact. 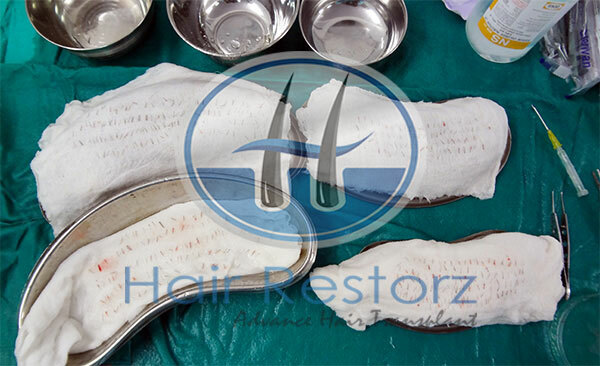 Selection of proper storage solution has grown increasingly more important as “mega-session” hair transplantation involving slimmer grafts have become more common and out-of-body time has increased. Survival of transplanted grafts has been shown to decrease by about 1% per hour out of the body time. Factors which reduce the graft survival during this extended out-of-body time include ischemia-induced hypoxemia and subsequent adenosine triphosphate depletion, as well as ischemia-reperfusion injury. Three types of storage media (intravenous fluids, culture media and hypothermic tissue–holding solutions) help minimise out-of-body variations in pH, osmotic balance, antioxidant capabilities, and nutrient support to the follicles. Various techniques are used to create and prepare the recipient area for transplantation of hair follicles. The critical element with donor area preparation is the angle and direction at which the hair follicles will leave the scalp leading to least damage to existing hairs and the creation of natural appearance of transplanted hair. The most widely accepted density of hair follicle insertion at the recipient site is 30 hair follicular units per square centimeter. Some of the practitioners advocate for a denser packing of more than 40 follicular units per square centimeter. This can however compromise the viability of the grafts as the competition between the transplanted hair follicles for a limited blood supply increases. Various techniques are used for recipient site creation and graft insertion. Blades may be cut to match the size of the follicular units to be inserted. 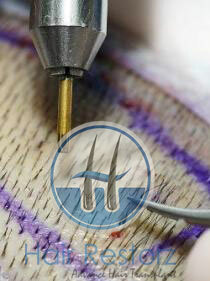 Some use hypodermic needles to make incisions for hair follicle placement. Recipient site size increases as the surgeon moves posterior away from the hairline and the priority shifts from single, fine hairs to multiple, coarser hair follicular units. A “stick-and-place” technique can be used to eliminate the time between which the recipient site is prepared and the hair follicle graft is placed within it. A “spread-and-place” technique reduces the mechanical trauma from hair follicle graft handling as the hair follicle is placed into a smaller recipient site. For insertion of hair follicle Jeweler’s forceps or similar non-toothed forceps are used to gently place the grafts into the recipient sites. Transplanted hair follicle viability is maximized by minimizing the mechanical trauma to the follicle during its insertion. This is accomplished by handling the dead portion of the hair (the part of hair which lies outside the scalp) rather than the sub-epidermal portion of the hair follicle itself. Some hair implantation devices allow for near-simultaneous recipient site creation and hair follicle insertion.